From mid-July on, my rooftop deck “garden” is in full swing. I have two tomato plants in a container and they are loaded with beautiful yellow and small red cherry tomatoes. All my herbs, peppers and red and green lettuce are ready to harvest. Everything aligns just at the time I crave these herbs and vegetables and most days I make myself a large salad for lunch or as an accompaniment with dinner. I first laid my lips on this salad dressing at a local neighborhood restaurant and was lucky enough to get the chef to share his recipe with me. I’ve since changed it a bit (surprise, surprise), and I’ve actually tried it with cilantro and lime in lieu of tarragon and lemon. Surprisingly it wasn’t even close to the marriage of flavors you will enjoy in the tarragon version I’m sharing below. And initially I thought the recipe contained too much lemon juice/vinegar proportionally to the olive oil, but it works and makes one of the best dressings in my repertoire. For me, that is a huge statement since I can’t even count how many salad dressings I make. This one always makes the cut in July when the tarragon grows like wildfire. 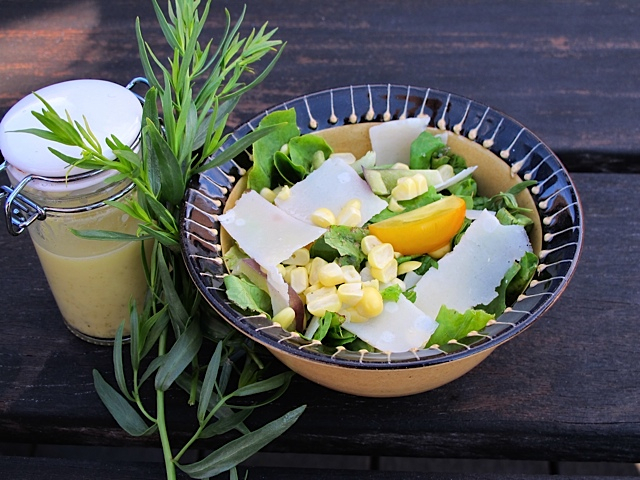 I should kindly ask you to make a salad for this lovely dressing that is somewhat delicate – think about fresh corn kernels, avocado, cherry tomato, paper thin slivers of white mild cheese… nothing too crunchy or overpowering. You’ll thank me. Put everything in the blender and process until smooth. I actually use my immersion blender for this – so simple! I put very little of the dressing in the bottom of the salad bowl, then add the lettuce and veggies and toss. 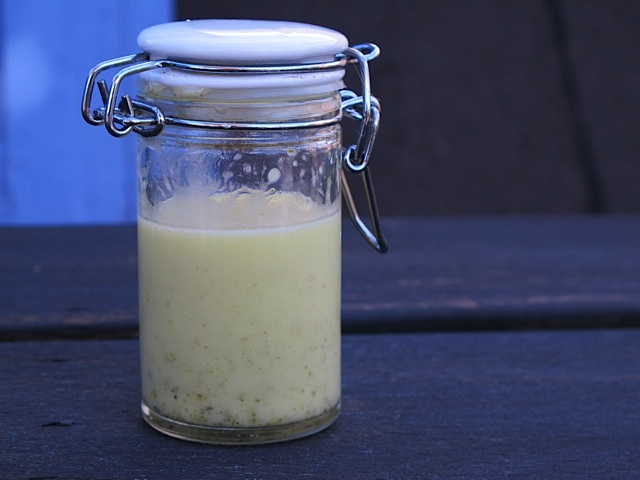 This dressing will keep, covered in the refrigerator, for up to two weeks. This entry was posted in Condiment, Salads & Dressings and tagged Tarragon Dressing, Tarragon Summer Salad. Bookmark the permalink.